“Come away with me,” he said and the first thing I thought of was that rubbish Norah Jones song which probably wasn’t the whole feeling he was trying to evoke. I didn’t have him down for a Norah Jones fan, like maybe he had a crush on her, but secretly and he’d never buy an album he’d just put it on spotify occasionally and feel a bit guilty about it. He had a lot of vinyl. You might think a romantic gesture could only go one of two ways: the thrilled acceptance or the crushing rejection, but when he said it, when he proffered his flowers and batted his eyelashes like a camel with sand in his eye and gestured towards the garden, I just didn’t quite know what to do with it. The silence was becoming tense now, as we stood in his kitchen in a tangle of uncertainty and confusion, because we’d been friends for 30 odd years and this was something new. “I mean, come this way,” he said. “Please?” And he blushed. And I blushed because his shyness his suede jacket his habit of fiddling with his sleeves suddenly seemed the most endearing things in the world. “Yeah,” I said. “Ok then.” And I followed him. Out into the garden. Out to the shed. He waved his arms around in a way that meant I should go in first and if I hadn’t known him since St Columba’s primary I might have worried that there was going to be a head in a box but I remembered when he wet himself in class 3 so I thought the chances were low. And so I opened the door. There were fairy lights all strung up. An ancient record player. He shuftied past me and put the needle to the record. A song came on I didn’t recognise. He took down a bottle of Johnnie Walker from one of the shelves. Poured himself a glass, passed one to me. And I wasn’t in Kilmarnock anymore. 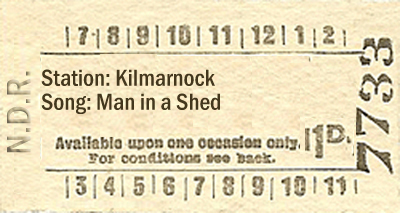 Not Kilmarnock now, anyway. I was thinking of that student party all those years ago. I was remembering the moment when we nearly kissed. Nearly. Not quite. The closest we ever came to us. And I was wondering why we swerved it. “I like you,” he said, bringing me back to the shed – to the fairy lights, to the music, to the brilliant awkward weirdness of it all. And I blushed, again. “You could have just asked me out,” I said, trying to pretend my heart wasn’t about to beat its way out of my chest. “It’s not been the best of times. I didn’t know if you’d…” he trailed off. “A thing? From a song? Not a Norah Jones song?” I said, and instantly wished I hadn’t because he wouldn’t know what I was on about. How would he know what I was on about. “No. Not Norah Jones.” He smiled. Coughed. Blushed again. “Would you like to dance?” he said. “I’d love to dance,” I said, and meant it.